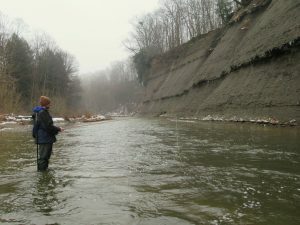 Fly fishing for steelhead in a Lake Erie Tributary. Being aware of water temperature can be very helpful in locating and targeting steelhead in Lake Erie tributary streams. This information can be obtained by carrying a stream thermometer at all times to record the temperature. Also, the USGS (http://waterdata.usgs.gov/nwis/rt) provides internet real-time water temperature readings for some Ohio streams (Rocky, Conneaut). Steelhead holding locations in the stream will vary daily, or even within a day, as water temperatures change. Steelhead naturally seek current breaks in which they can comfortably hold and rest, and the locations of these resting areas will vary with water temperature. Because steelhead are cold-blooded, their metabolism decreases as water temperatures fall, and they lose their ability to hold in faster currents. In the fall, starting in late August, steelhead stage along the Lake Erie shoreline. Good numbers congregate by mid-September when shoreline temperatures dip to 68 degrees F. Visit http://www.coastwatch.msu.edu/twoeries.html for Lake Erie surface temperature map. Targeting early fall steelhead along the shoreline (when the lake is flat) and at the mouths of tributary streams can result in some fantastic fishing. These lakeshore fish, the legendary fall “chrome bullets”, can be taken by stripping streamers and wooly buggers with sink tip lines and shooting heads. Steelhead begin running into the tributaries in large numbers when cool fall rains bring substantial tributary run-off and night time air temperatures drop. Stream temperatures in September and October, cooling to the 45-50 degree F range, maintain the metabolism of fall steelhead, allowing them to hold in faster water like the heads, lips, and tail-outs of pools, fast runs and chutes, and fast pocket water. At these temperatures, steelhead will take flies aggressively. They will move out their way to take a dead-drifted egg pattern, nymph or small streamer and actively chase a swung wooly bugger or streamer. Energized fall steelhead can move great distances up a tributary under good flow conditions, though low water tends to slow upstream movement. In October-November, when stream temperatures cool to the 38-45 degree F range, steelhead avoid holding in very fast water, and will be found in the middle sections of pools, moderate runs, and slower pocket water flows. In December-February, when temperatures are often 32-37 degrees F, steelhead will be more lethargic. They will rest in areas along shale ledges in deep, slow moving pools, as well as slower runs, pool back-eddies, and the classic winter holding location of the upper pool tail-out of a deep sloping pool with very slow current. Under these ice water conditions, the “bite-zone” shrinks around a steelhead as they rarely move much for a fly. When they do bite, the takes are often soft and hard to detect. The fly fisher literally has to put the fly on the noses of these lethargic fish. To increase hook-ups, one should try multiple presentations, subtle adjustments of tippet size and split shot, and numerous fly changes, including sizes down to #16’s for egg and nymph patterns. In late winter and early spring, when days are longer and stream temperatures consistently rise into the ideal spawning temperature range of 40-58 degrees F, steelhead will move onto spawning gravel. Pre-spawn steelhead, will react to stream temperatures suddenly dropping or increasing above or below this spawning range by holding in areas adjacent to spawning beds in nearby runs, pools, pocket water and bank under-cuts. After spawning, the voracious eating “drop-back” steelhead will remain in the streams until temperatures reach the upper 60 degree F range, at which point they head to the Lake Erie shoreline. It is best not to fish for drop-back’s when water temperatures are above the high 60’s, since playing fish under these conditions can stress them to the point of mortality. Of course, steam temperatures do not remain constant throughout the day on Lake Erie tributaries. During the course of a day, water temperatures are typically coldest in the morning, making steelhead less aggressive and more prone to take a dead-drifted fly in moderate to slower flows. When temperatures warm into the afternoon, steelhead move into faster runs and pools where they may be more actively feeding. Late fall steelhead usually remain fairly active and aggressive, but unusual cold snaps that drop tributary temperatures 4 or 5 degrees F or more can put a damper on an aggressive steelhead bite. In these circumstances, fly fishers should look for steelhead in more fall or winter type locations and slow down the presentation. In winter, mid-day to early afternoon is typically when the warmest temperatures will exist. Even though water temperatures only increase a few degrees from the water temperatures of morning, steelhead may bite consistently, making afternoon the best time to fish. Being continually aware of stream temperatures, and the subsequent effects on steelhead activity and behavior, will lead to more success in hooking these great sport fish.